AMID a rainshower, a jampacked crowd at the Almendras Gym Davao City Recreation Center witnessed De La Salle University (DLSU) Green Archers and CM Farm Lyceum of the Philippines University (LPU) Pirates demolish their respective rivals at the start of the 82nd Araw ng Dabaw Sports Festival basketball invitational tournament Monday evening, March 18. DLSU Green Archers routed University of Cebu (UC) Webmasters, 82-66, as Joaqui Manuel sank 12 points and teammates Ralph Cu and Elhadji Amadou Seck Ndiaye scored identical 11. John Calvin Jabello, for his part, led the Webmasters with 12. DLSU associate head coach Gian Nazario, in a phone interview, said they were lucky enough to have beaten a "well-coached" UC led by Yayoy Alcoseba. "We admired how they (UC) played us. It was a nice game for us since we have a new coaching staff and some new players, it was a gauge how we are doing as a team after two months," Nazario said. He, however, said that winning the first game isn't a guarantee that they will go straight to the finals. "We're taking it one game at a time. We are enjoying the opportunity to play in Davao," Nazario added. 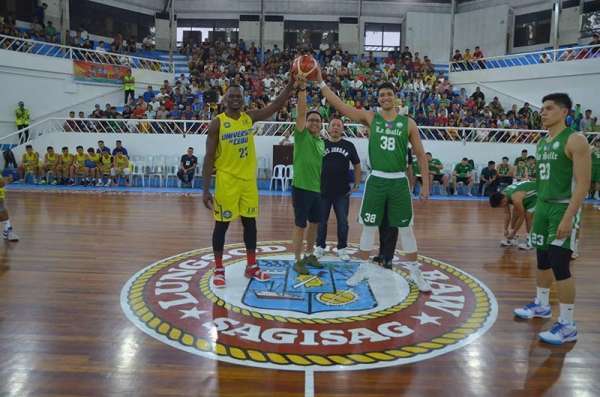 Meanwhile, CM Farm LPU Pirates clobbered University of the East (UE) Red Warriors, 69-59, in the second game of the cagefest sanctioned by Samahang Basketbol ng Pilipinas (SBP) under regional director Glenn Escandor and sponsored by the city government of Davao through the Sports Development Division of the City Mayor's Office (SDD-CMO). Rhanzelle Yong drilled in 13 points to lead the Topex Robinson-led Pirates' victory. Assistant Coach Gilbert Malabanan said, "Mas nakapagpahinga lang kami siguro kasi Sunday pa kami dumating sila (UE) kahapon lang at may laro na kaagad sila." He said they were readying for the game against UC set yesterday presstime since the latter has a hardworking import. "Depende sa game mamaya (versus UC) if tuloy-tuloy na sa finals. Kung saka-sakali na makakatapat namin ang DLSU, mas mahirap silang kalaban dahil quality players nila at may import na seven footer at dalawang 6'8 na sabay-sabay pang naglalaro," Malabanan said.